Stone Island Jumper – Kitmeout Designer Clothes – Fashion Blog & Fashion Forum. LAB and LIFE, the two faces of Stone Island. LAB is the incessant and continuous research into materials and treatments. The result of its never ending vocation to daring experimentation. LIFE is its lending experience and perception. Strong aesthetics providing status to its wearer. A recognisable and impactful transversal sportswear for everyday use. These two cores have been merged into a single idea to create the Spring Summer _011 collection. References and inspiration taken from the various environments have been carefully investigated in order to create useful functions and details. Ocean Navigation, the Navy and Uniforms have been rewritten with a modern, urban vocabulary. The treatments modify the aspect of materials and as always make the difference. The fabrics come to life and gain body, matte or shiny qualities, depth, shading. Special dyes have been used to achieve metallic highlights that recreate the appearance of the bodywork of latest generation sports cars. Iridescent surfaces have been achieved by laminating them with nylon monofilament mesh. Two-tone effects have been created printing and plating techniques. Modern technology has revitalised fabrics from the historic archive. As a partner of the hotel Bayerischer Hof, the most prestigious hotel in Bavaria, Stone Island is playing an important role in the project POLAR BAR – the newly inaugurated temporary outdoor bar located on the hotel terrace on Promenadeplatz. The project is by Horst Wittmann and Konstantin Landuris, the young, emerging German designers and owners of the studio Hansundfranz, who designed the “POLAR BAR” as a polar station, with a nomadic and very flexible character. Guests get the impression that polar scientists stopped for a little while in the eternal winter to have a party on the ice. The bar elements are reminiscent of expedition containers and are equally handy: they serve both as the bar counter itself and as storage space. The metal surface with its honeycomb pattern has an industrial look and was originally used in the automotive and aeronautic industry. 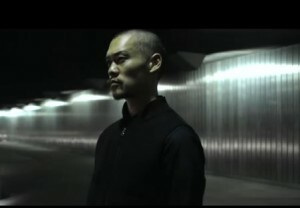 Stone Island’s contribution to the project is based on the use of some of its most innovative materials: the Ice Jacket Fabric, the heat sensitive fabric that changes color according to changes in temperature and Reflective Fabric, which is highly reflective owing to its coating of glass micro spheres. These fabrics have been used for the fleece-lined blankets offering protection from the cold and the covers of some of the furnishings. Innegrit Volkhardt, owner of the Bayerischer Hof hotel. 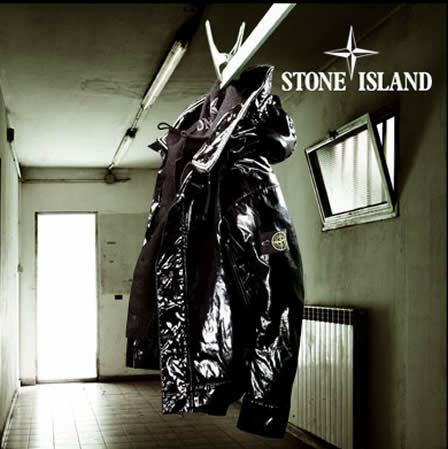 Stone Island Clothes – The journey inside Stone Island begins. Stone Island Denim has always been a hit! 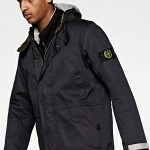 Although Stone Island epitomises a “Man’s Brand” some of the denim styles introduce a touch of Yin to this geezers realm. Check out one of the widest online collections here. 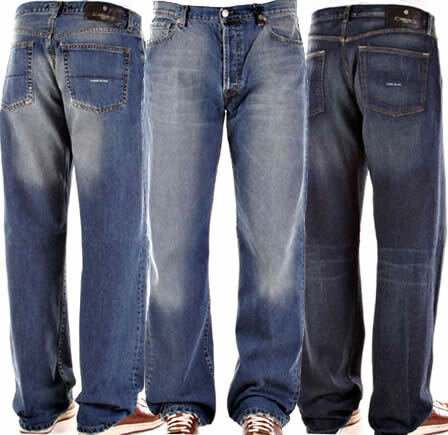 Whatever your thoughts about Stone Island, the fact is Stone Island jeans are a definite cut above the norm. Take a butchers! “Spring/Summer 2007. 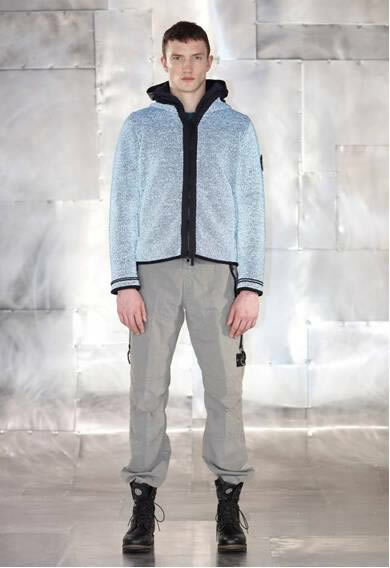 Stone Island’s spring/Summer 2007 collection contaminates sportswear with military uniforms. These two influences are linked by the same need for functionality. They come together to create architectural and contemporary sportswear. Each garment has a unique DNA. Even the most hidden details have a special use and function. Fabric research and technology is always paramount. Elements from diverse industries are developed into urban functional fabrics. Reflective: First used by Stone Island in 1992 this fabric is reintroduced as a commemorative jacket to mark 25 years of Stone Island as a high visibility blouson. The fabric is composed of thousands of glass microspheres that reflect light, even when only the tiniest amount is available. This is also adapted into a hooded blouson with a high shine nylon double layer. Ventile: An extraordinary completely water-proof fabric in 100% cotton is able to perfectly combine breathability and protection from all weather conditions in blousons that guarantee to be the highest performing natural fibre. Sheepskin blousons are white hand-painted, according to the Marine tradition. Sheepskin trims are also used on jumpers, sweatshirts, collars and hoods as an external shelter or as detachable inner lining.Â Double layers resemble the volume and roundedness of sheepskin with single layer wools for parkas, blousons and Navy pea coats. Down jackets are super-light (at only 37 grams a metre) the only â€œheavyâ€ detail is the canvas hood in printed and shiny-coated cotton with a wax effect. Stone Island is continuously developing fabrics to increase strength. VentileÂ® is a fabric in 100% â€œall weather cottonâ€, transpiring wind/snow and waterproof.Â David a new Japanese fabric is a heavy microfibre. It is compact and waterproof, treated with coagulant pressing and washing with a rubberised effect. Knitwear is authentically Stone Island but with new compositions and detailing. Heavy knit sweaters are produced in wool, cotton, wool/cotton, double-worked or coupled.Â Blouson knit sweaters are thick and heavy, coupled inside with a wind-proof net.Â Light knit sweaters in chenille or combed wool.Â Heavy sweatshirts are named â€œhigh altitudeâ€ due to their considerable warmth, in nylon-padded cotton with a great thermal capacity, a concept developed from the aeronautic underwear of the Second World War. 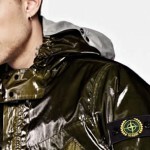 Stone Island Clothing the end of an Era? Â For over a decade Stone Island clothing has been a “must have” piece of clothing for every lad who likes a drink with his mates and a scuffle on the terraces. 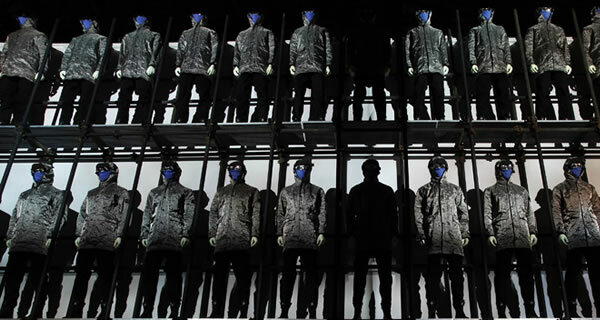 The Stone Island masterminds positioned their brand so intelligently it gained a true cult following. 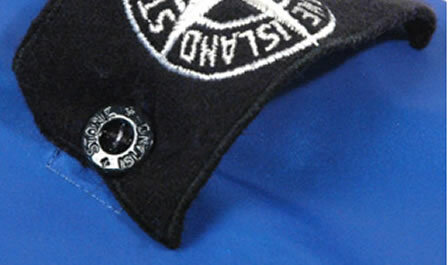 Stone Island clothing, especially the well designed and tailored Stone Island Jacket, was meticulously marketed and intelligently distributed so the brand maintained its reputation for elitist “lad-fashion”. The question posited in this brief articles is: are those days over?